Paypal available. To pay by check, email me your order and address, and I will reply with a total for your order with postage and tax. To register for an upcoming workshop, use Take A Workshop. Productive Spindling Available again, at regular retail prices (it hit >$100 on Amazon! Wow!). A terrific resource for learning to spin on spindles and to punch up your technique. Covers Top Whorl, Bottom Whorl, and Turkish spindles. A modern resource for this ancient spinning method. If you don't want to order it from the author (me!) you can get it from Amazon. The book is spiral-bound, 50 pages, with color cover and black-and-white interior pictures. See more about it on the blog And use Amazon's look inside to see more. Price: $18 for 1, $10.80/ea for 4 or more (wholesale price). Select the appropriate option for the number ordered. Looking for the Bellwether's Learn to Spin Kit? 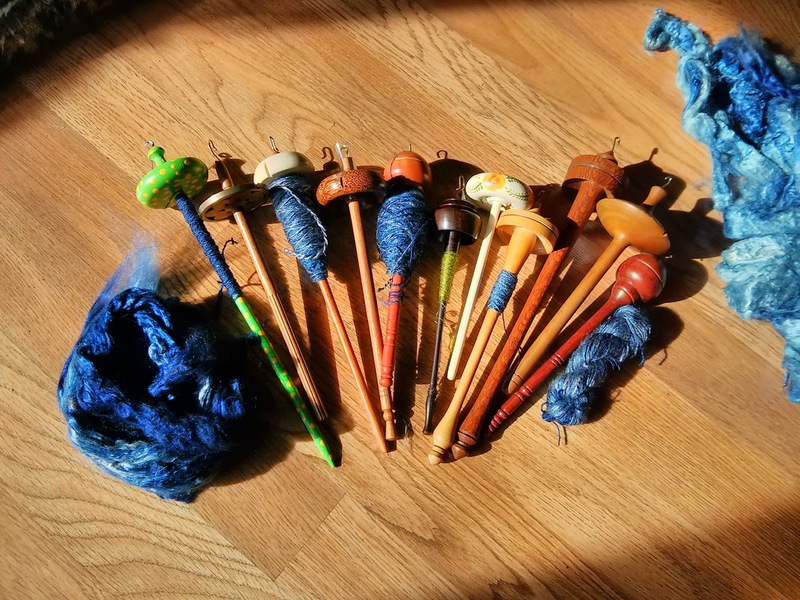 Order the book (Productive Spindling) and the spindle (The Bellwether Spindle) below in one order, add a comment to your order asking for some starter fiber, and I will toss in a ball of the medium wool roving I teach spindling with. If you forget to add the comment, use the Contact Form as soon as your order is done. 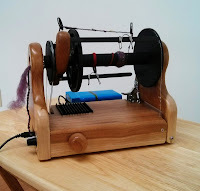 I am always happy to get folks started in spinning. The Bellwether Spindle has been praised by students and teachers alike as a well weighted, general purpose spindle. Its weight, 1.6oz, is suitable for DK to worsted weight yarns, and its shape provides a long spin time. Buy just one, or get the teachers' discount by ordering 4 or more. Bare wood, all grown and made in the USA, ready for your hand or whatever wax, oil, or paint you'd like to apply. Zinc hook from my local hardware store, reshaped by me. All spindles assembled by me or my family. Price: $12 for 1, $7.50/ea for 4 or more. Select the appropriate option for the number ordered. E-books are emailed as PDFs once I receive payment. It's a manual process, so if I am outside wifi range it might be a bit before I see the order. If you prefer an online library, three of these e-books are available on PatternFish. I would be happy to resubmit the others if there is interest. If you are interested in handouts for other workshops I teach, contact me to see if they are available. Power Spinning covers all the ins-and-outs of spinning on an e-spinner. Learn maintenance tips, how to use the speed and tension control, and use of a quill so you can put your e-spinner through its paces and spin the yarn you want. A fun knit scarf pattern is included. Color in Plying explores the yarns you can create with a space-dyed roving or top. Navajo-plying, self-striping 2-plies, cables, Navajo 4-ply, Fractal Plying, and more are discussed in this 10-page e-book. Includes a fun brioche scarf knitting pattern as a great way to show off your colorful yarns. Exotic Fiber Spindling give you tips and technique for spinning the exotic fibers -- cashmere, yak, camel and more -- on spindles. It covers Akha and Featherweight Top Whorl Spindles. A lovely knit shawlette pattern is included. Silk on Spindles provides tips and techniques for spinning luscious silk on spindles. This fiber's challenges are met head on with practical advice for success. A lovely lacy knit scarf pattern is included. Core Spinning gives you the steps to take to spin this fabulous art yarn, and the perfect scarf pattern to feature your core yarns. Using a core and a luscious batt, you can create amazingly lustrous and unique yarn. This e-tutorial is for wheel spinners. Spinning Slippery Fibers covers a wide range of fiber types. Are you ready to step beyond wool? But finding other fibers challenging? Mohair, Silk, Alpaca, Angora, even Cashmere and more are mastered with tips from a dedicated spinner. Techniques for spinning these fibers on both wheel and spindle are provided. Self-Striping Sock Yarn learn a fun yarn construction and tips for spinning good sock yarn. This yarn knits into tight-knit socks with fun stripes, starting with solid colors of fiber. Includes a pattern for fingerless mitts, a great way to test the durability of your sock yarn results.